Your alarm probably went off an hour early after the country moved into daylight saving time. Did you want to hit the snooze button? If your body complained, it had good reason. Most Americans lose at least an hour of sleep after setting their clocks ahead. An hour may not seem like much. Medical research, however, suggests that it has an impact on our bodies. Switching to daylight saving time has been linked with a possible increase in the car and workplace accidents, heart attacks, and severe headaches. One of the first persons to suggest moving the clock to keep up with the lengthening day was Ben Franklin. In 1784, he argued that having daylight last longer into the evening would save energy. Nearly 100 years later George Vernon Hudson, a New Zealand artist and amateur insect collector, proposed the idea in an 1895 paper. Why? He wanted more time to collect bugs after work. Some European countries adopted it soon after. Beginning in the 1940s, some US states adopted it, and the federal government standardized the dates in the 1960s. Whether springing forward and falling back actually save energy is a matter of debate. Factors such as the increased use of air-conditioning come into play. Arizona and Hawaii, two states that have warm climates, have not adopted Daylight saving time. Neither have many countries that lie near the earth's equator. There, the change of light during shifting seasons is not as great as in the northern and southern regions of the Earth. What might explain these effects? The most important cue for our internal clocks is light. When we suddenly change the time by an hour it alters the amount of light we see during the day. The result is our internal rhythms get off kilter. So do our sleep-wake cycles, the timed release of hormones, and even our moods. Effects on the sleep cycle present more serious consequences than you might think. Clearly sleep is a key component of psychic and physiological balance. So is the lack of it. Who hasnt felt fuzzy brain from lack of sleep? But research now also links poor sleeping habits to obesity, diabetes, heart disease, and high blood pressure. A study just published in the journal Proceedings of the National Academy of Sciences found that getting too little sleep just a few nights in a row can disrupt hundreds of genes, including those tied to stress and fighting diseases. Unfortunately, the disruption of the body clock caused by daylight saving time may be long term. 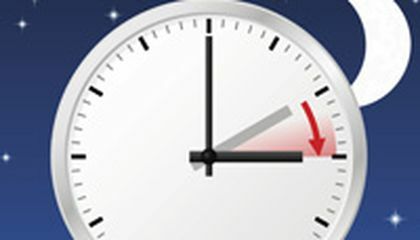 German researchers reported in October that our internal body clocks never really adjust to daylight saving time.